When business owners in Colonial Heights, VA, need help with their locks and doors, they call Buckley’s Securitysmiths for professional and emergency services. We are the home of the area’s premier commercial locksmith services for your office, warehouse, retail or other business. Our experienced locksmiths come to you if you’re locked out and can’t get to work. We know time is money, so we answer calls quickly and maintain affordable pricing. No matter what time of day or night you need us, Buckley’s Securitysmiths technicians are ready to come to the rescue. Not only that, our experienced commercial locksmiths can handle a variety of issues, from making duplicate keys to installing sensitive high-tech locks at your location. If you have more than one location, we have physical locations in Petersburg, Chester, and Colonial Heights, VA, but our mobile services come to you anywhere in the area. So, don’t hesitate to call us for all jobs, large or small. Come to us for a relatively cheap locksmith that specializes in commercial properties. We say cheap because we’ll save you a lot of money in the long run. We can get you into your business even if you have a broken deadlock. Let us rekey locks on the spot or install modern technology, such as panic devices, that protect your business and employees or tenants Buckley’s Securitysmiths excels at the following business locksmith services. Installing your own panic bars or exit devices can lead to frustration and put your property at risk if done incorrectly. This sensitive hardware is subject to OSHA regulations and requires specialized training to install properly. Let us install or fix your panic devices fast, so you can concentrate on running your business. Push button locks are sensitive and prone to sticking after years of use. 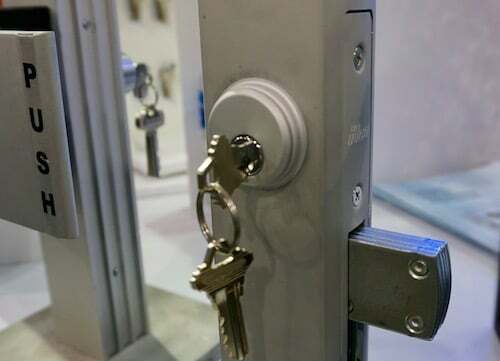 Allow us to resolve the issues or replace these locks with more durable and secure solutions. If you’re concerned about a former employee or trusted partner and no longer wish them to have access to your business, Buckley’s Securitysmiths provides rekeying services that ensure your security and ease your mind. To do this the lock is disassembled and reassembled correctly, and the pins are removed and matched up with the new key. 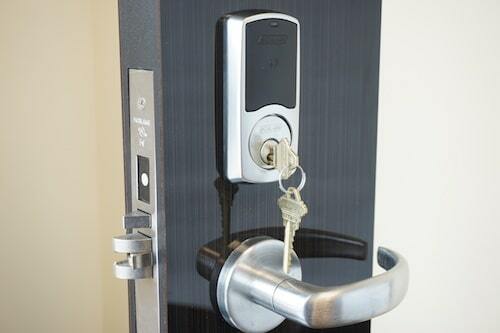 A keypad lock uses a keypad to gain access to the building without requiring a key. The hardware can become faulty and is fairly tricky to fix. Let us replace them for you for a lightning fast solution. Ask us about your business lock and door needs. Whether you need to fix, repair or replace antiquated locks or are having problems with newer, fancier systems, we can do the job. We are experts in electronic locks, keyless entry, exit devices with alarms, and also provide simple lock repair and installation. Here’s a listing of some of our service and product offerings for our commercial customers. Whether you need a door lock picked, repaired or installation help, our experienced commercial locksmiths come ready with the tools and the knowledge to get the job done right the first time. Contact us today for more information.